Edmonton Oilers prospect Bogdan Yakimov has spent the majority of this season playing for the Oklahoma City Barons in the AHL, and the 6’5” centre has done reasonably well, putting up 28 points in 57 games as a 20-year-old rookie. In late March he did an interview with a Russian outlet talking about his experience, and on Wednesday portions of that interview were translated into English. The original interview was conducted by Dmitry Belousov of Business-Online, and most of the critical material was translated by Alessandro Seren Rosso of The Hockey Writers. The original is worth a look through Google Translate for those really interested; there is some untranslated material there, including what looks like a funny joke about Yakimov leaving his number with Belousov to pass on to girls interested in marrying him. But the meat of the article makes its way (in far more readable form) to Rosso’s translation, and Yakimov comes across as a guy who is finding his way pretty well in a different country and culture, as well as a player who is being well-handled by the Oilers’ development system. Three points in particular stood out to me. 1. Edmonton reminds him of home. After mentioning how much he enjoyed the city of Los Angeles during his brief NHL stint, Yakimov mentioned how much Edmonton reminded him of his home town of Nizhnekamsk (which is also where Nail Yakupov comes from). 2. The importance of mentorship. Yakimov specifically mentioned teammate Jason Williams as someone he tried to imitate, saying that he always watches what Williams is doing and emphasizing the importance of having that kind of teammate to learn from. Williams, who turns 35 this summer, was seemingly brought in to fill the same role that Josh Green did for the Barons. In each case, the player was a long-time NHL’er in the twilight years of their careers but still capable of bringing competence and experience to an AHL team. 3. He’s getting ice time. Asked about his role in Oklahoma City, Yakimov told Belousov that he’s primarily being used as an offensive forward, but also that of late he’s been taking on really significant ice time for the Barons. The whole piece is well worth reading, but the feeling of the piece comes across in those excerpts. Yakimov seems to be enjoying his time in the AHL, getting opportunities and being well-handled by the coaches. 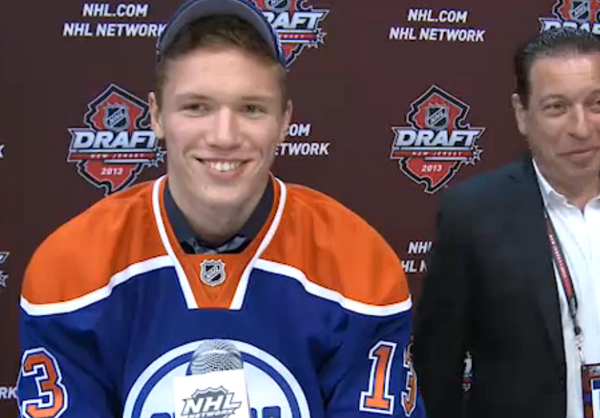 He’s arguably the most important prospect in the minors, so this is all good news for the Oilers. Oilers Prospect Update: CHLers Shine, Bogdan Yakimo-ved? I’m not sure why, but today I just really had enough. I guess seeing the flames enjoy a playoff race yesterday and actually succeeding doesn’t sit well today. I’m a guy whose moved away from Canada, works a crappy 9-5 job, goes home to his condo in a crappy neighborhood, whose only sense of connect with being back home is watching the Oilers. Everything feels backwards for me. Watching the game yesterday with the flames fans cheering and the players looking like they were all happy for each other as a team is something so foreign to the Oilers and myself as a fan. Sure the Flames defied all odds and advanced stats, but why can’t we? Shouldn’t that be us? We’ve sat here for almost a decade of suffering being told to sit on our hands and wait for something, so don’t we deserve a payoff? This is more than a favorite team for me. It’s an escape from where my meandering life has taken me. Watching this team is a pitiful reminder that stuff that should makes sense doesn’t happen. The fact that experiencing tough times will lead to eventual happiness is something I can’t believe anymore. I can keep waiting like Oilers brass hoping for all this to change making small adjustments, but I don’t have the luxury of receiving a nice paycheck, or a nice house to go home to. So I’ll go ahead and make the changes I need to for my life to get better, and not sit around thinking everything is going according to plan. I am fortunate to have an education and a business degree, but I won’t lie to myself saying I’m really close to where I expected myself to be. Why *did* you move away from Canada to work a crappy job then go home to a condo in a crappy neighbourhood? Thinking you deserve a payoff, just because the team has been $hit for almost a decade is the same mentality that Katz and Lowe used when they decided to tank. That is the mentality of a loser that will never breed success. seemed to breed cups in 91,92, and 09 for the pens and 10 and 13 for the Hawks and the kings in 12 and 14. I also love how the Flames are the model for how it is done all of sudden, right now they are nothing more that the 14 Avs, 13 Leafs, 12 Yotes – a team that defied odds and that is it. Do you know what all of those teams have that the Oilers haven’t in the last 9 seasons. Playoff appearances. Though none of them have 3 consecutive 1st overall picks, sub .900 goaltending, or a POHO with 6 Stanley Cup rings. The fact that so many people trashed your comment is what’s wrong with Canada. We won the lottery of life people. We get to live in a beautiful free country and complain about hockey. Not water shortages, explosions, violence, being worried about our sisters, moms, wives and whether they’ll get assaulted in the streets. The fact is we should be thankful we all have jobs and homes to go back to. He’s right our lives are determined by our mentality. Being a negative human being just makes your life worse not better. Shh. Shh. It’s going to be ok. Craig’s on it. You have won the internet for a day. Congrats! Just you and 4 or 5 other people according to the trash/cheer meter. Russian players have been good for us. Which Russians have been good for the Oulers? Are you sure? How about more Belov, Grebeshkov, Nikitin? Russian forwards? Yes. Russian defensemen? No. You don’t have to look too far, just look at Team Russian. Their forwards are probably the best and their defensemen are undoubtedly the worst. Always nice to hear a prospect actually praise this city. Here’s hoping he can continue to develop next season with the Condors in an even more prominent role. Could be playing a role as a third line centre or winger sometime in the 2016-2017 season. Should be a good player for us….in 2-3 years. In the minors? The Barons are all playing in the NHL. Looks like the next Roman Oksiuta. It’s OK the flame pussies will have an early first round exit just in time for T -time with Hallsy n the boys.